Red rice is a special variety of rice that looks red in color, thanks to its anthocyanin content. It is generally unhulled or partially hulled rice which has a red husk, rather than the much more common brown. Red rice has a nutty flavor, and a high nutritional value, as the germ of the rice is left intact. Red rice may refer to:Red rice, also known as weedy rice, a low-yielding rice variety that persists as a weed in fields of better-quality rice. Rakthashali, a rare rice variety. Thai Red Cargo rice, a non-glutinous long grain rice variety. Bhutanese red rice, a medium-grain rice grown in the Kingdom of Bhutan in the eastern HimalayasCamargue red rice, a relatively new variety of rice cultivated in the wetlands of the Camargue region of southern France. Red Rice, Hampshire, a small hamlet just south-west of Andover, Hampshire, EnglandRed Rice, a traditional Gullah Lowcountry dish, similar to West African jollof rice. Rich in fiber: red/brown rice, red/brown rice or black rice has a high fiber content. As with the white rice contains only simple carbohydrates, red/brown rice contains complex carbohydrates that are good for health. Controlling blood sugar levels: red/brown rice has a low glycemic index. The glycemic index is a number that indicates the potential for increased blood sugar that comes from carbohydrates. With a low glycemic index, red/brown rice has a part in regulating blood sugar levels and insulin production. In addition, red/brown rice is a good source of energy that the body needs. Making full faster: A study conducted in the British Journal of Nutrition found that eating complex carbohydrates, such as oatmeal, red/brown rice and potatoes, will make you full faster for hours and eat no more than 320 calories per day. Contains antioxidants to counteract free radicals: red/brown rice is a good source of iron or manganese. Mangan, who was instrumental in producing energy for the body is an essential component of the enzyme and is an antioxidant that can protect the body from free radicals that are formed when the energy produced. 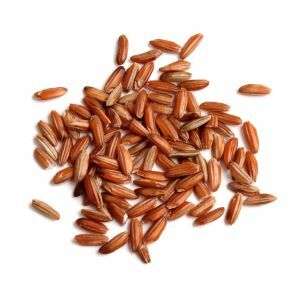 In addition, red/brown rice is rich in zinc, a mineral that helps accelerate wound healing and maintain the body's immune system to function properly. Just as iron or manganese, zinc is also rich in antioxidants that protect the body from free radicals that can damage cells and tissues in the body. Containing Vitamin B6: By eating just one serving of red/brown rice, can meet 23 percent of vitamin B6, the amount needed for the functioning of the organ. This vitamin is needed to help balance the formation of serotonin, red blood cells and helps the production of DNA cells. Lowering bad cholesterol levels: red/brown rice is known to help lower bad cholesterol. By eating red/brown rice, it will help increase the level of good cholesterol. Therefore red rice can be a staple food and a good source of carbohydrates for health.